Frankly Speaking: Three dollars, and worth every penny . . . I am reading Bob Greene's book, Fraternity: A Journey in Search of Five Presidents. I came across it in Big Lots the other day while Mrs. Frankly was shopping for . . . whatever it was she was shopping for. I loved Greene's Once Upon a Town, so I picked it up. By the time Tracy found me reading in some recliner destined to become a Christmas gift for someone's lucky husband, I had already chewed through the first chapter. I've always thought that there should be an unwritten rule for those of us who were born after World War II: Whenever you meet an old combat pilot from the war, you are automatically disqualified from thinking that your life could possibly measure up to his. He beat you before you blinked in the light. 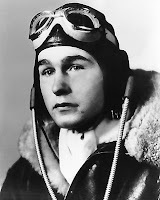 Yet somehow Bush - and McGovern - had been judged by millions of their countrymen, and by commentators who had never heard a shot fired in anger, as if they were lifelong croquet players, badminton aficianados, instead of men who, when it counted, piloted bombers against the enemy during the greatest war in the history of human conflict. Both Georges, and millions of other men and women just like them, deserve our thanks. And, in a smaller - but no less sincere way - Bob Greene has earned mine. Those freedoms with which so many seem to abuse or of which they are so completely ignorant, had a terrible price. The effects of this socialization are found here in this month's article in Hillsdale College's "The Imprimis"
Good stuff, once again Brother and Thanks from one whose son would appreciate it.